The Duke de Richleau is an adventurer. He is also ofttimes an operative working with British Intelligence during the highly nationalistic times of the first half of the 20th Century. His rich heritage, multi-national upbringing and his ability to walk easily and comfortably in the highest echelons of the various European governments make him a perfect instrument to not only report on events but also help manipulate them. But first and foremost, the Duke is an adventurer. He loves the excitement and challenge and danger that he routinely pushes himself into. Over the years depicted in the eleven adventures he gathers together three men of like-mindedness and with these fellows tackles the mundane denizens of crime such as thieves, arsons, extortionists, and murderers as well as the more exotic terrorists, anarchists, political assassins, saboteurs, and more than one double and triple agents. Born with the first name of Armand, the future Duke was from his birth the Count de Quesnoy, a title earned because of his parentage. His father was a French nobleman. His mother was a Russian princess. He was raised in the northern Carpathian Mountains possessing in truth several citizenships because of his lineage. At 18 he felt it important to establish and strengthen his French nationality so he left the Balkans and moved to the land of his father, then the Duke. His personal fortune from inheritances made it unnecessary to have a job but idleness was never in his nature. Since he wanted to be known as French, he felt it important to help serve France. He joined the French Army and for the next few years engaged in numerous activities that saw his rank rise until he had reached the rank of Brevet Lt. Colonel. He also was known increasingly as an avid Royalist. The Fourth Republic was having more than its share of scandals and unrest and the nobility increasingly fell being a desire to again have a King rule the country. Though he never fought against the nation per se, his leanings were enough to cause him to be allowed to resign his commission. Very much in love with his lovely Angela and at odds with his paternal country, he moved to England and gained citizenship there. With his wife expecting their first child and his new homeland offering many opportunities, he might never have lived the adventurous life he was destined for had not an anarchist's attack claim his wife and unborn child while on a trip to Spain on behalf of England. He was devastated by the loss but eventually he was pulled out of his depression to exact vengeance and then to move on. The Duke is described as moderately tall, quite slim but athletic. He has dark slightly wavy hair which would naturally over the years gain more gray. His face is said to be oval in one report and long and thin in another leading to a disagreement. Not in question is his grey eyes with flecks of yellow that sparkle when excited and an aquiline nose. It is also mentioned that he carries himself with the "easy grace of a man who had spent most of his life hunting, dancing, fencing, and soldiering". More than one report of the activities of the Duke de Richleau refer to him as the leading member of a small pack of "modern Musketeers". While the Duke would have scoffed at the position of leader, despite it being true, he would have chuckled and been amused at the group's epithet especially since it is so very true. The others in the unofficial group have the same love of adventure and danger as the Duke and without them, the Duke might still have engaged in many of the escapades but he would not have enjoyed them nearly as much. - Rex van Ryn, a much younger man than the Duke, scion to a very wealthy American banking dynasty. Until he met the Duke, he would more likely be found playing sports or courting beautiful women than working in banking. - Simon Aron - an English Jew financier also much younger than the Duke but probably ten years older than van Ryn. He loves good food and beverage but seldom to excess. - Richard Eaton - an English nobleman with a decent inheritance, he loves to indulge in the arts and can afford to do so at his pleasure. Together these men, each having the means to afford to drop everything to go off on an adventure and the temperament to do just that. These men are all ferociously honest and gallant and each has a love of justice and the determination to mete it when necessary. 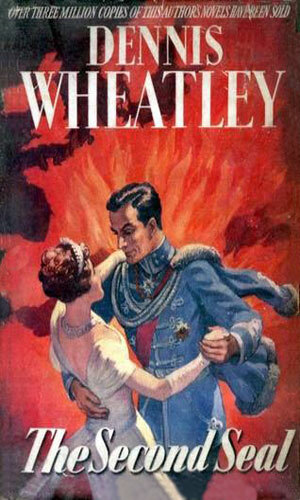 As was Wheatley's tendency, the order of the books' writing and publishing do not match at all the chronology of the character. 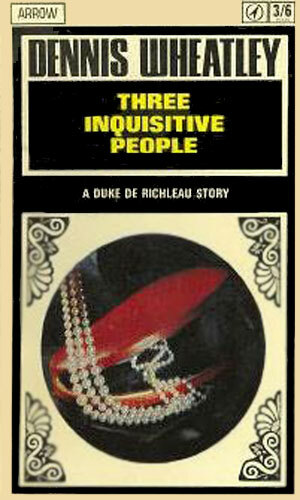 His first book was Three Inquisitive People which created what he considered modern day Musketeers, de Richleau being the leader and main character. The publisher to whom he sent the book rejected it as not being enough of a mystery as they were publishing at the time (apparently too adventurous). 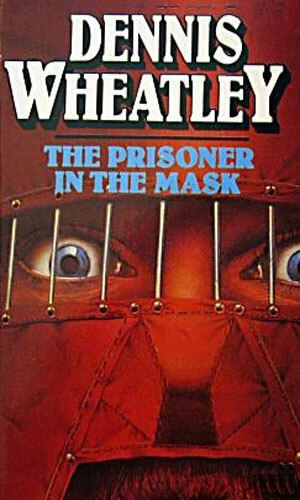 As the publisher was deciding, Wheatley wrote the second book in the series, The Forbidden Territory which was snatched up by the publisher and proved to be a big hit. Several years and several books later, his first novel was released. 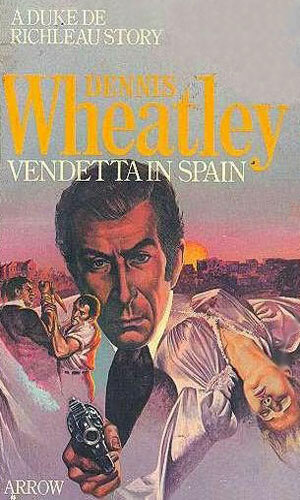 In time and usually in answer to repeated questions by fans, Wheatley wrote books about the earlier days of the Duke and The Prisoner In The Mask and Vendetta In Spain came to be. In his late 20s and early 30s, Count de Quesnoy (later Duke de Richleau) fought on the side of the Royalists in France to bring an end to the latest Republic and put a King back on the thrown. The year is 1906 and newly naturalized British citizen de Quisnoy and his wife Angela are in Spain as part of his noble duties. An anarchist's bomb takes his wife's life and sets the future de Richleau on a path of vengeance. It is at a masked ball in 1914 that the Duke de Richleau comes across a beautiful woman and, getting closer to her, also gets closer to a terrorist society and a new career as a British secret agent. A murder in the high society of London has the police investigate the crime but they seem to always be behind three men who are deeply interested in the case - the Duke de Richleau, Rex Van Ryn, and Simon Aron. 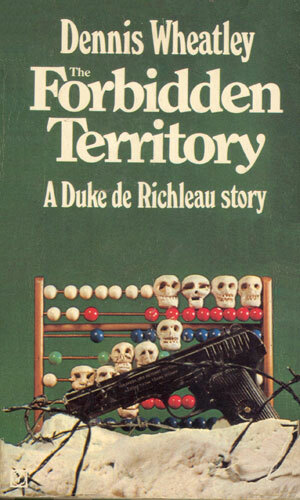 The Duke de Richleau receives a coded message from his young friend, Rex Van Ryn, who was hunting lost treasure in Russian when the Soviet took over and found himself a prisoner there. The Duke and Simon Aron decide they must get him free. Rex Van Ryn becomes infatuated with a woman who is getting involved in the Black Arts. The Duke and his friends, Aron and Eaton, find pulling Van Ryn from the grips of others involved is hard and quite dangerous. The Duke de Richleau is sent to Spain as the Civil War there wages in order to find a hidden stash of gold and retrieve it before the Communists can get their hands on it. He asks the help of his close friends but finds they have more sympathy for his opponents' cause than his. The Second World War has just started. The Duke and his frequent companions are in Poland involved in a mission to disrupt Hitler's plans, a task that will take them to numerous hot spots in Eastern Europe. The Duke de Richleau ponders how the Germans are proving so successful at finding the Allies' convoys at sea. He suspects they are using supernatural means and is determined that he and his friends find a way to stop them. One of the Musketeers, Rex van Ryn, has gone missing in Argentina and the Buenos Aires branch of his family's bank is missing over a million dollars. The Duke and companions are determined to find the truth, however it turns out to be. Rex van Ryn's adult son and Richard Eaton's grown daughter are working towards learning the facts behind her recent inheritance which take the Duke and others to Ceylon and to a series of theft, arson, and murder. Major rewrite to the book. 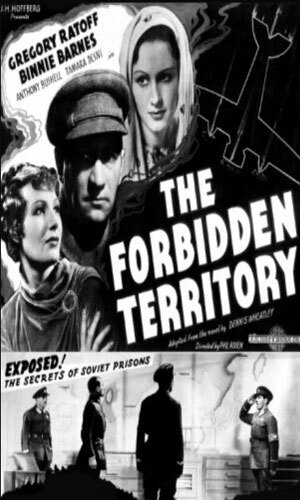 This movie has a British Sir Farrington traveling to the Soviet Union with his son in search for another son being held in prison. 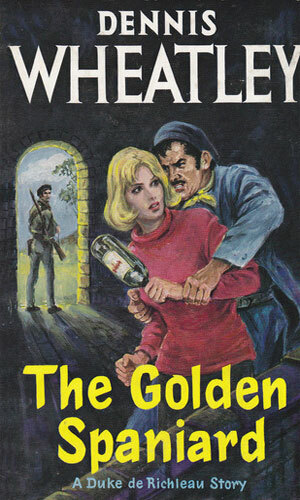 They plan to get him out with the help of the prisoner's love, Valarie. The Duc (Duke) de Richleau and his friend Rex van Ryn learn their mutual friend, Simon Aron, is getting very deep into a group of Satanists. They are determined to free their friend from the peril he is increasingly falling. 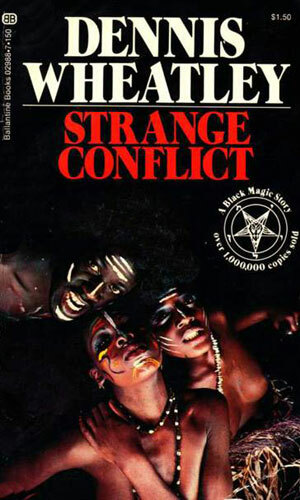 I first became interested in the author, Dennis Wheatley, when I was a teenager gaining an interest in Black Magic, admittedly to find ways to "mesmerize" women and get cool power. 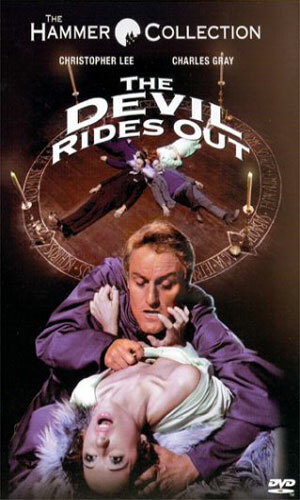 The whole Worship the Devil was never for me, good Methodist boy that I was, but horror films that Hammer produced and the neat bad things that any character Christopher Lee played was huge draw. 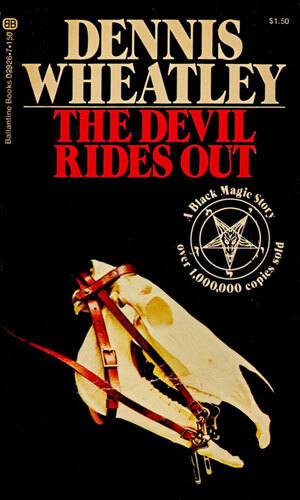 And Wheatley had his own love affair with writing about the occult but he made sure to let readers know bad guys practiced it while good guys fought it. 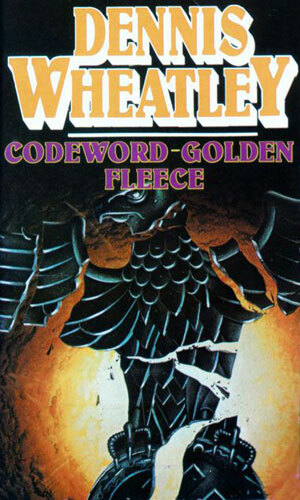 When my short-lived occult phase passed, my appreciation for good storytelling remained and Wheatley was a fine example of good storytelling. His action flowed nicely and evenly. His characters, a tad sterotypical perhaps, were believable and interesting. And he had written about several different spy characters and had the decency to make each one unique. The aging Duke de Richleau is nothing like the younger (though later aged as well) Gregory Sallust or the pre-20th Century Roger Brooks. The plots were quite a bit different as well. But they were all good. 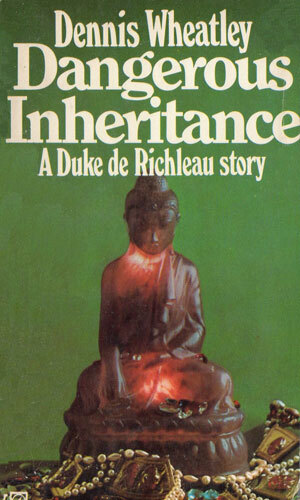 I found it interesting to learn many years later that the one movie made from a de Richleau book happened to star Christopher Lee as the protagonist. I enjoy twists like that.